"Twelve Prophets" redirects here. For the sculpture, see Twelve Prophets of Aleijadinho. 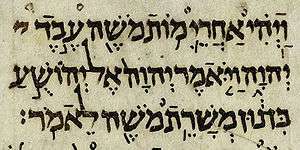 The Minor Prophets or Twelve Prophets (Aramaic: תרי עשר‎‎, Trei Asar, "The Twelve"), occasionally Book of the Twelve, is the last book of the Nevi'im, the second main division of the Jewish Tanakh. The collection is broken up to form twelve individual books in the Christian Old Testament, one for each of the prophets. The terms "minor prophets" and "twelve prophets" can also refer to the twelve traditional authors of these works. The term "Minor" relates to the length of each book (ranging from a single chapter to fourteen); even the longest is short compared to the three major prophets, Isaiah, Ezekiel and Jeremiah. It is not known when these short works were collected and transferred to a single scroll, but the first extra-biblical evidence we have for the Twelve as a collection is c. 190 BCE in the writings of Jesus ben Sirach, and evidence from the Dead Sea Scrolls suggests that the modern order was established by 150 BCE. It is believed that initially the first six were collected, and later the second six were added; the two groups seem to complement each other, with Hosea through Micah raising the question of iniquity, and Nahum through Malachi proposing resolutions. Many, though not all, modern scholars agree that the editing process which produced the Book of the Twelve reached its final form in Jerusalem during the Achaemenid period (538–332 BCE), although there is disagreement over whether this was early or late. Scholars usually assume that there exists an original core of prophetic tradition behind each book which can be attributed to the figure after whom it is named. The noteworthy exception is the Book of Jonah, an anonymous work containing no prophetic oracles, probably composed in the Hellenistic period (332–167 BCE). Oracles or speeches by the prophets, usually in poetic form, and drawing on a wide variety of genres, including covenant lawsuit, oracles against the nations, judgment oracles, messenger speeches, songs, hymns, narrative, lament, law, proverb, symbolic gesture, prayer, wisdom saying, and vision. The comparison of different ancient manuscripts indicates that the order of the individual books was originally fluid. The arrangement found in current Bibles is roughly chronological. First come those prophets dated to the early Assyrian period: Hosea, Amos, Obadiah, Jonah, and Micah; Joel is undated, but it was possibly placed before Amos because parts of a verse near the end of Joel (3.16 [4.16 in Hebrew]) and one near the beginning of Amos (1.2) are identical. Also we can find in both Amos (4.9 and 7.1–3) and Joel a description of a plague of locusts. These are followed by prophets that are set in the later Assyrian period: Nahum, Habakkuk, and Zephaniah. Last come those set in the Persian period: Haggai, Zechariah, and Malachi. However it is important to note that chronology was not the only consideration, as "It seems that an emphatic focus on Jerusalem and Judah was [also] a main concern. For example, Obadiah is generally understood as reflecting the destruction of Jerusalem in 586 BCE. and would therefore fit later in a purely chronological sequence. In the Roman Catholic Church, the twelve minor prophets are read in the Lectionary during the fourth and fifth weeks of November, which are the last two weeks of the liturgical year. They are collectively commemorated in the Calendar of saints of the Armenian Apostolic Church on July 31. ↑ Redditt 2003, p. 1. ↑ Coggins & Han 2011, p. 4. ↑ Redditt 2003, pp. 1–3, 9. ↑ Floyd 2000, p. 9. ↑ Dell 1996, pp. 86–89. ↑ Ben Zvi 2004, pp. 1193–94. Coggins, Richard; Han, Jin H (2011). Six Minor Prophets Through the Centuries: Nahum, Habakkuk, Zephaniah, Haggai, Zechariah, and Malachi. John Wiley & Sons. ISBN 978-1-44434279-6. Dell, Katherine J (1996). "Reinventing the Wheel: the Shaping of the Book of Jonah". In Barton, John; Reimer, David James. After the exile: essays in honour of Rex Mason. Mercer University Press. ISBN 978-0-86554524-3. Floyd, Michael H (2000). Minor prophets. 2. Eerdmans. ISBN 9780802844521.
of Mopsuestia, Theodore; Hill, Robert C, tr (2004). "Commentary on the Twelve Prophets". The Fathers of the Church. Catholic University of America . Nogalski, James D; Sweeney, Marvin A; 3, eds. (2000). Reading and Hearing the Book of the Twelve. Symposium. Society of Biblical Literature . Petterson, Anthony R., ‘The Shape of the Davidic Hope across the Book of the Twelve’, Journal for the Study of the Old Testament 35 (2010), 225–46. Redditt, Paul L (2003). "The Formation of the Book of the Twelve". In Redditt, Paul L; Schart, Aaron. Thematic threads in the Book of the Twelve. Beihefte zur Zeitschrift für die Alttestamentliche Wissenschaft. Walter de Gruyter. ISBN 978-3-11017594-3. Schart, Aaron (1998). "Die Entstehung des Zwölfprophetenbuchs. Neubearbeitungen von Amos im Rahmen schriftenübergreifender Redaktionsprozesse". Beihefte zur Zeitschrift für die alttestamentliche Wissenschaft (in German) (260). Walter de Gruyter . Zvi, Ehud Ben (2004). "Introduction to The Twelve Minor Prophets". In Berlin, Adele; Brettler, Mark Zvi. The Jewish Study Bible. Oxford University Press. ISBN 978-0-19529751-5.